Cumani: "I don't think he'll go to the St Leger, 1m 6f would be a little bit punishing for him, but the owner will decide in the end"
Postponed ran out an impressive winner in the late absence of Derby runner-up Kingston Hill. Ridden confidently by Andrea Atzeni, the 5-2 favourite took up the running from the free-going Odeon with two furlongs to run. 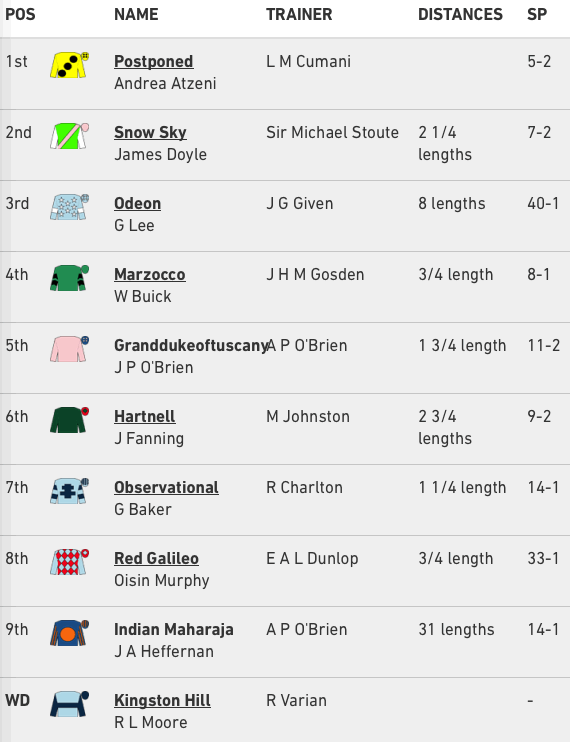 Snow Sky had tracked Postponed along the straight and while Sir Michael Stoute's inmate beat the rest easily, he was two and a quarter lengths behind the winner. Odeon stuck on for third at 40-1 for James Given. Postponed would need to be supplemented for the Ladbrokes St Leger at Doncaster in September, but Cumani is cool on the idea of stepping him up to a mile and three-quarters. He said: "I don't think he'll go to the Leger, I see him as a true mile-and-a-half horse. He travels well and quickens well, just like a mile-and-a-half horse, but obviously the owner will decide. He was good, but we've always thought he was. We just probably wasted too much time over shorter trips in the spring. "I was thinking what there is left, and there isn't much, especially as he needs fast ground, so we will have to think long and hard about what we do with him." Atzeni is confident there is more to come from Postponed, saying: "We always thought a lot of him. Mr Cumani always liked him. 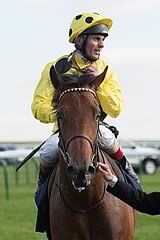 He's a good horse, an improving horse, a typical Dubawi. "They went a nice gallop and that suited him nicely. The ground is very important to him - he likes fast ground. He's going the right way, which is the main thing." Cumani mentioned races like the Prix de l'Arc de Triomphe and Breeders' Cup Turf as possible targets for Postponed next season. He said: "He's not a Leger horse. I don't want him to go further than this as I think he's a top-class mile-and-a-half horse." Teddy Grimthorpe, racing manager for owner Khalid Abdullah, said of Snow Sky: "We're very pleased with that, he was coming back at the winner at the end, and I think we'll look to Town Moor (Doncaster)." James Given is also looking at the Classic for Odeon. The Lincolnshire handler said: "He will get better in time but at the moment it is like training a firework with the touchpaper already lit. It took two good horses to go past him and I thought it was a great run. We have to go to the Leger now."